The day Raquel has been dreading for months has finally arrived. Sasha, her best friend in the whole world, has died of cancer. Overwhelmed and brokenhearted, Raquel can't even imagine life without her. And then a letter from Sasha arrives. Has she somehow found a way to communicate from beyond the grave? 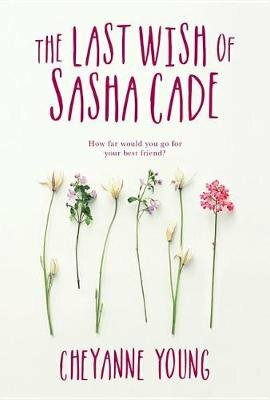 In fact, Sasha spent her final weeks planning an elaborate scavenger hunt for the friend she would have to leave behind. When Raquel follows the instructions to return to Sasha's grave, a mysterious stranger with striking eyes is waiting for her. There's a secret attached to this boy that only Sasha --- and now Raquel --- knows. This boy, Elijah, might be just who Raquel needs to help her move on from her terrible loss. But can Raquel remain true to herself while also honoring her friend's final wish? Cheyanne Young's compulsively readable breakout novel offers abiding friendship and forbidden romance, along with an incisive look at how class differences shape who we are and who we grow to be.